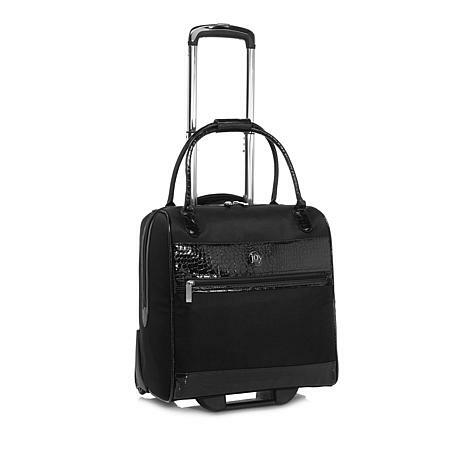 Joy's wheeled pullman meets all of your needs in one fashionable, convenient and sturdy bag. Use as your go-to piece for a quick overnight trip and more. With RFID-blocking technology, you'll feel safe and stylish as you travel Joyfully. bought it for travel for work. Roomy and lightweight. Holds a lot of stuff like charging cords etc. 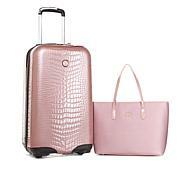 You can even put a small purse in when you are limited to 1 personal item and a carry on. 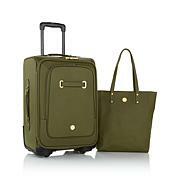 First piece of Joy luggage. Will definitely buy more pieces. A black bag is so boring and no one will ever mistake this lovely purple bag as being theirs. I bought to use as my work bag and it is great! Light weight and the wheels are easy. Plus I have it in teal and no one else has such a pretty work bag. I always upgrade my work bag with a Joy or Iman bag every year. This one has it all. I like that it has wheels but you can also carry it too! It has RFID protection and is made out of strong material that doesnt rip or stain. A real winner! I enjoy using it thus far. Zipper a little hard to use. But I recommend highly.